Day 1- Preikestolen. “It's not an adventure unless it involves grass in the middle of the road!” That's what my parents always said and it's so true! So we set off down a road far too narrow for any sensible motorhome with a trailer to attempt… and found the most beautiful spot at the end of it- right opposite the world-famous Pulpit Rock, or Preikestolen to give it it's full title! Here's how to find motorhome camping near Preikestolen… Wandering Bird style! You can see the video of this amazing place right at the bottom of this post! Where is the secret Motorhome camping near Preikestolen? Is there other motorhome camping near Preikestolen? 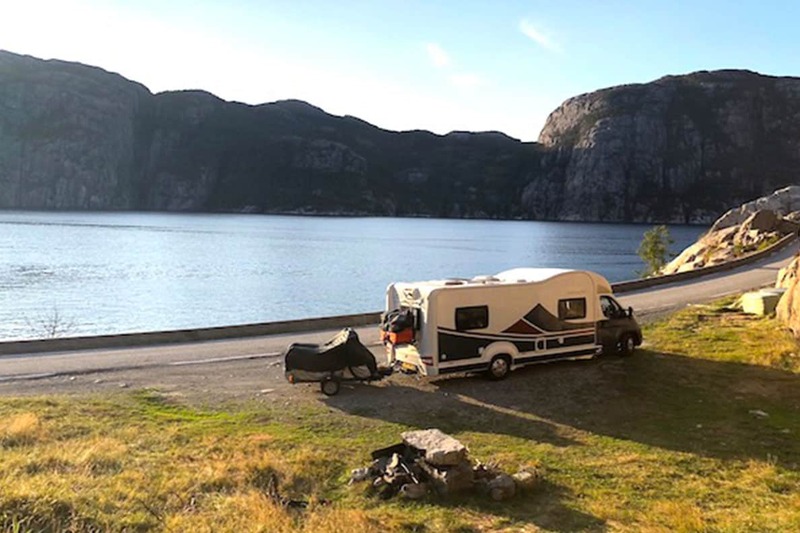 Would you recommend this motorhome camping spot near Preikestolen? After the ferry to Oanes (or get to Oanes from the North) cross over the bridge below (heading south). Almost immediately after the bridge there is a tunnel, and straight after the tunnel turn right. Are you ready? Take a deep breath, especially if you're in a motorhome- and WATCH OUT FOR OVERHANGS!! The road is narrow and there are NOT many passing places! Very important tip– lorries/ tractors and other motorhomes use this road. Lorries and tractors DO NOT STOP until the very very very last minute. You will probably terrify yourself- but it's ok. You have just as much right to use the road as they do. The road is very narrow- only possible for one user at once. The worst bit is the part closest to the main road where there are blind bends and no way of seeing what is coming. We used our horn on every turn- but the lorry which was coming straight at us didn't bother to beep back, so don't rely on this method!! There is also a tunnel which I think has a height restriction of 4m, so don't use this road if you are taller than that! You can see the video of the road below. Keep driving and, eventually, you'll find this lovely little layby, which is NOT a passing place. Tuck yourself as far back as possible and settle in to enjoy some magic. Absolutely. Norway has this awesome rule where wild camping is allowed (and often encouraged) as long as you are respectful. Don't park within sight of a house if possible. Don't block access to a driveway or building. Don't make loud noise or leave litter and don't stay in one place for weeks on end! There is a small village near the spot and there were several people who came for a walk during the evening. We got chatting to a local Norwegian gentleman who was admiring the van and was perfectly happy we were parked there. The only thing he was annoyed at were some local campers who had hung a hammock in the trees nearby- apparently, that's frowned upon. There's a couple of places listed on Park4night, but it's one of the few areas in Norway where it's hard to find overnight parking. You are NOT allowed to camp in the parking area for Preikestolen- apparently, they're quite strict on this. It's about a 30-minute drive back to Preikestolen, so our idea was to leave early in the morning to miss the crowds. However, two things happened which changed our minds! Firstly, the nice local gentleman asked us if we were going up Preikestolen tonight to see the screening of the Mission Impossible 6 movie, which features Preikestolen. When he saw that we had no idea what he was talking about, he alerted us to a screening of the movie, at the top of the cliff, with over 1500 people buying tickets!!! The thought of 1500 people pushing and shoving at the top of a cliff with no barriers gave us the heebie-jeebies… so we decided against that. Instead, we chose to get up early and watch the sunrise from the cliff near us. We set the alarm and we got up about 5am. The sky was just starting to turn pink. We walked a little way, started to set up the drone and felt the first specks of rain… which then turned into a torrential downpour. Within seconds, we were soaked to the skin and frantically trying to pack away drone, cameras and stay as dry as possible- which was a losing battle. We ran back to the motorhome as quickly as possible, where Mr WB promptly went back to bed and I sat feeling very sorry for myself! 🙂 Still, here's the photo I took just before the heavens opened. Sunrise over Preikestolen- before the heavens opened!! Absolutely!! It was beautiful, quiet and an amazing place to spend a day or two. There was space for a campfire- make sure you have it on the beach, not near grass in the summer as there are concerns about wildfires. There are tractors which pass throughout the evening and early morning, but otherwise there's very little traffic. We chose to leave about lunchtime the next day and we only encountered three vehicles on the way out- one of those being the lorry that didn't want to stop!!! We used Park4night for nearly everything- especially finding spots to dispose of waste etc. A couple of the places were no longer in use, and I updated them on the app as we found them, but most were very accurate and easy to use. We only stayed in a campsite once- and that was only for the view and the laundrette- we didn’t use electric at all! !